The trip from Cornwall to the Highlands would last over 20 hours, but despite the cost passengers would not find themselves travelling in the lap of luxury – the first and last parts of the journey do not even have first-class carriages. Doe told the Evening Standard: "For the price I would expect to be given a meal as soon as I got on board. What do you get with CrossCountry? For the first 183 miles to Bristol you might get a trolley service offering a cup of tea. This momentous milestone was reached thanks to the free-market efficiencies of privatisation; since 1995 (when they were set by the inefficient socialist bureaucracy of British Rail), some walk-up train fares have doubled in price. "When you can fly half way across Europe for £30, the idea that you can end up paying £1,000 for a train journey in Britain is absolutely scandalous. "Not only are passengers being encouraged off the trains and into their cars, but some considering this journey may decide they'd rather fly to Australia and back for half the price." The railway company points out in all fairness that if one buys the advance fare in time, one can get this journey for a mere £561, bringing a train trip across the UK down to the cost of one low-season return flight to Australia. 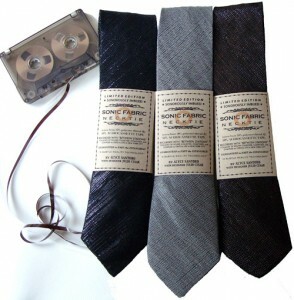 A sound artist from New York, now based in the desert of Texas, makes neckties woven from audio tape, prerecorded with sound collages made from samples recorded in New York. If you dismember an old Walkman and pull the playback head out, you can run it over your tie, making noise. If you want to order one (and live in the US), you can do so here. Type foundries and browser makers have agreed on an open embeddable font format for the web. The Web Open Font Format, developed in collaboration by parties including the Mozilla project and geekier-than-thou type foundry LettError (which was cofounded by one Just van Rossum, whose brother created a somewhat popular programming language), is essentially a repackaged, compressed variant of TrueType/OpenType. Somewhat surprisingly, it not only contains no DRM (which would have been a deal-breaker for open formats; Microsoft tried introducing an IE-only DRM-locked TrueType variant, but wasn't successful), but also contains all the data that a desktop font does, only slightly rejiggered to make it unusable in existing desktop systems. (I'll give them a week before someone writes a script that rips WOFF fonts to TrueType fonts.) This is surprising because the commercial font industry, producing something that's labour-intensive and skill-intensive but infinitely copiable, has until now jealously guarded its intellectual property, refusing to license its fonts for embedding in desktop formats. Instead, now they're keen to license them in slightly obfuscated versions, with the understanding that browsers enforce a same-origin linking policy unless there is additional license information. (I was thinking that, if the industry wasn't keen on letting its vector fonts out onto the web, it could have been possible to devise a resolution-limited font format, based on several sizes of bitmaps, with vector hints (i.e., "pixels 36-40 are a vertical stroke"), and generate all intermediate sizes using an interpolation algorithm. Such fonts would, of course, degrade if scaled above the maximum resolution in the file.) Another rationale could be that the market for web fonts could eclipse that for print fonts, and web font licensing would be easier to enforce (web sites, after all, are findable, and presumably unlicensed fonts would be easy enough to detect). Licensing issues aside, WOFF promises to provide more than merely letting you put your favourite fonts on your web site. While Firefox 3.6 will have basic WOFF support, the next version of the specification promises to give more control, allowing web designers to fine-tune typographical parameters, selecting alternate forms including ligatures, different types of figures (lining and old-style, tabular and proportional), proper small caps, alternate figures (such as swash capitals) and such.